The variations in color and shape are endless. In everyday life we ​​face the funniest plastic objects. Of course, there are also very useful items to find. 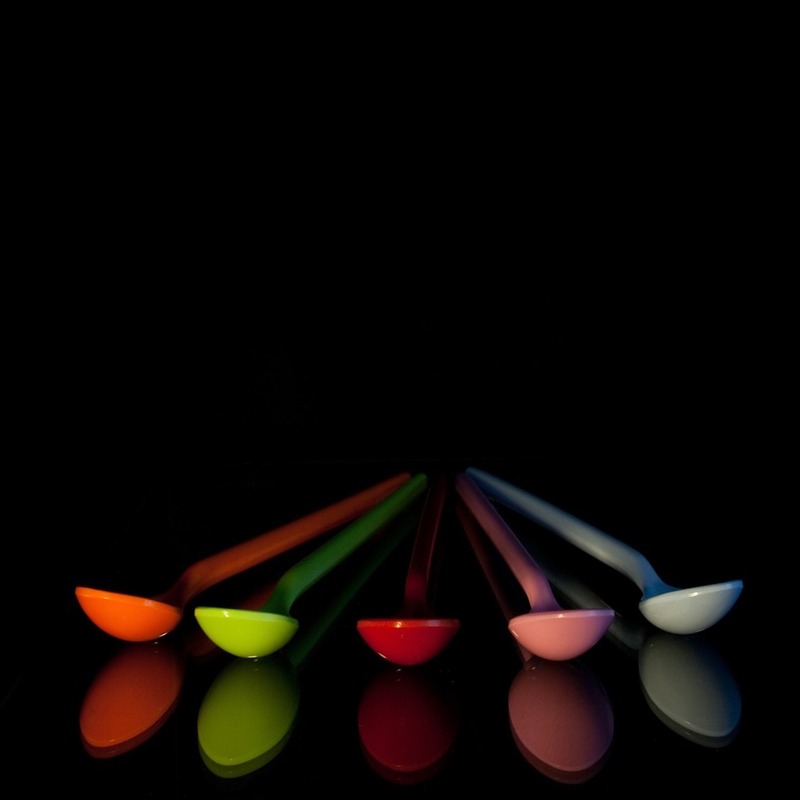 The applications for plastics ranges from colorful children’s crockery and cutlery, via coffee cups, bottles, ribbons, boxes, to packaging and much more. They are almost indispensable in today’s world. Usually, they are quite robust and durable and have a longer durability than “natural” products, such as cardboard. In this day and age, the correct disposal and environment-friendly recycling in the context of sustainability plays an essential role. Plastics are, as the name suggests, artificially manufactured and can not easily be decomposed by the environment, such as biodegradable products. Today, everything is constantly evolving. New substances are being developed and their quality improved. Constantly, new products are being offered on the market. By environmentally friendly recycling, the used materials can be “reshaped” and reused again. Our daily waste products are now much more than just “garbage”. They contain valuable raw materials that can and should be recycled. The “life cycle” of a product describes its duration, or durability. If a product exceeds this cycle, the validity and quality status of the product can no longer be fully granted. In order to restore the lost value of a product, it is returned to the material cycle. The fabrics reappear at the end of the recycling process as a new and fully functional product. The basic chemical structure of the artificial substances allows different recycling methods. Among other things, a distinction is made between material recycling and the mechanical (or chemical) recycling process. LuxFlux orients itself with its technology in the first mentioned field. With its software, LuxFlux supports and simplifies the work and the production processes in material recycling. 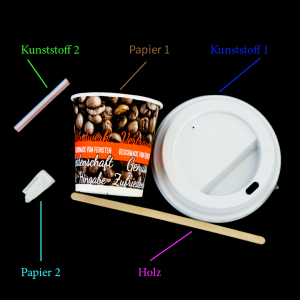 The left illustration shows an original photography of a coffee mug with various accessories (see material inscriptions). In many cases, the different substances are disposed together by the consumer (without presorting). The same objects are also shown on the right picture. This is a false-color coded image. 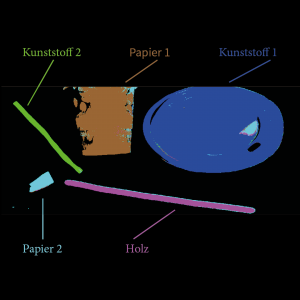 The material characteristics or material differences that appear in the hyperspectral analysis are visualized on the right in a simplified way. With this method the different substances can be identified and classified in a fast way. You are welcome to contact us by phone (+49 7121 69 63 60-0).